Make your big day go as smoothly as possible. 1. Doing research? Including the word "wedding" in your search makes things more expensive...so DON'T DO IT! 2. One of the best things to splurge on is a wedding coordinator/planner. It'll save you lots of stress and anxiety! 3. However, cheat sheets, like these ones, can help you stay organized and stress-free. 4. Save things like contracts, spreadsheets, timelines, and to-do lists in a digital folder (like DropBox) so it's easy to access on hand. 5. To avoid accidentally missing something important, create an entirely separate email JUST for wedding-related things. 6. Save more by looking into vacation rentals, which may be a cheaper alternative to a traditional wedding venue. Check out "14 Incredible AirBnbs Where You Can Get Married Without Breaking The Bank." 7. Or consider having your reception at a restaurant. They will already have tables, place settings, chairs, etc., which will save you a TON on rentals. 8. But if you want a traditional wedding venue, you can save money by finding a place that doesn't require you to use their vendors. 9. If you're exchanging "I dos" in a quaint farm setting, you may want to see if the owner can sell you whatever florals you need at a wholesale price. 10. Even though it may be more convenient for guests, you can save a ton of money by not booking the date on a Saturday. 11. And off-season weddings — like January or February — are good ways to save a lot of money. 12. If you're doing a destination wedding, tell everyone to be at the place an hour early. That way, there's wiggle room for getting lost/stuck in traffic. 13. Create a unique "ask" by using Ringpops to propose to your bridesmaids. 14. A clever hack for RSVPs: number each card that correlates to a guest. That way, if it comes back illegible, you'll know who it's from! 15. Using a foam and water brush or sponge can make the process of sealing envelopes quick and painless. 16. Get your guests excited by suggesting they request a song for the DJ to play in their RSVP. Get these cassette tape song request cards from LoveMeDoDesign on Etsy for $7.19. 17. Digital save-the-dates or invites are great money savers. 18. If you have a wedding website, make sure you put a call-to-action on your save-the-date cards! A message as simple as, "Be sure to check out our site" will do. 19. Only invite the people you both have talked to in the last two years to keep your guest list from becoming out of control. 20. If you don't want to add plus ones, be sure to make sure your guests's invites only have their name on it. And it is TOTALLY fine to not allow plus ones. 21. 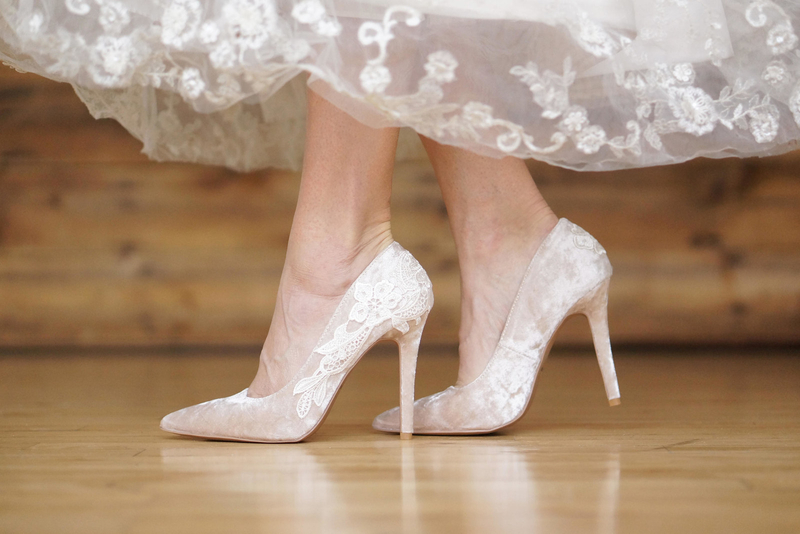 When you're dress shopping, bring a pair of heels that are similar in height to what you'll be comfortable wearing on your big day. 22. And, while wedding dress shopping can be overwhelming, try using these helpful diagrams to narrow down your style before you even begin. 23. Even if a dress looks strange on a hanger, it's worth at least trying on because it may look completely magical on you. 24. Also, be sure you're happy with how your dress looks from the side — because PICTURES! 25. Try shopping for white dresses that aren't specifically labeled as wedding gowns. 26. It can be complicated to pee in your wedding gown, but there are some handy hacks that can help you. 27. 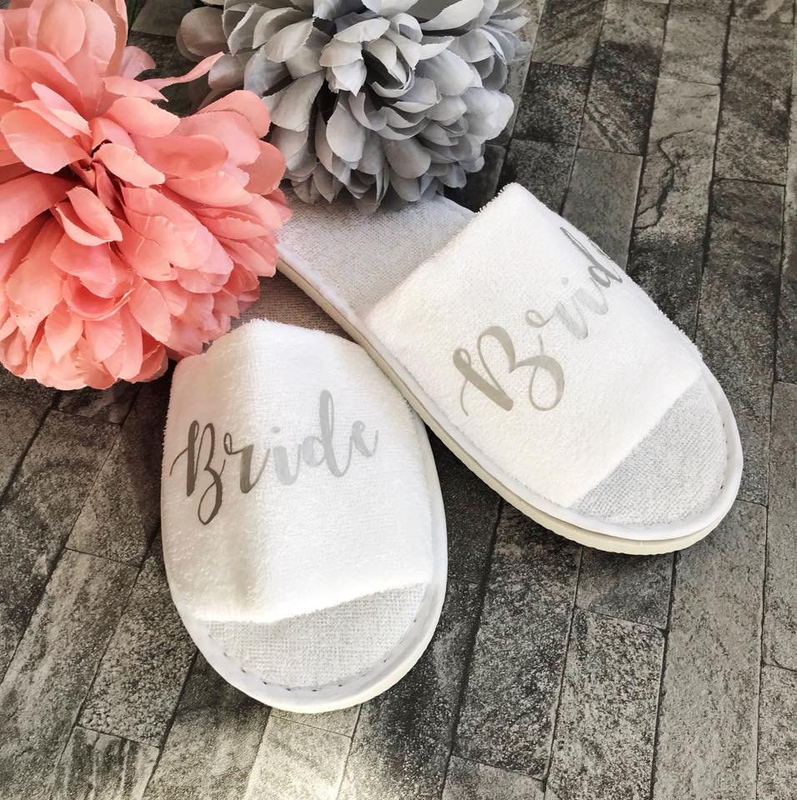 You're going to want to pack three pairs of shoes: comfortable shoes for getting ready, your wedding heels, and another pair for dancing. 28. But also! Don't forget to break them in before you wear them to avoid blisters and other discomfort. 29. Use sandpaper to help de-slip the soles of your shoes so you don't have a Chandler moment. 30. You may also want to look into Solemates for your heels to prevent them from sinking into grass. 31. Get creative with your "something blue" by painting the soles of your shoes. 32. Or create a memorable, super rad keepsake by buying customized Converse shoes for dancing at your reception. 33. Crepe-paper flowers make a good alternative to a bouquet — and they'll last forever! Get this Aphrodite Paper Flower Wedding Bouquet in Petite from ThePaperFlowerMarket on Etsy for $140. 34. Veil weights do exist, and they can help combat a windy wedding day. 35. Many jewelers will professionally clean your ring for free — and you'll want to do this before the wedding so it sparkles and shines. 36. Sure it may sound relaxing, but avoid getting a facial right before your wedding. It's possible that products or the method used could cause your skin to become irritated, dry, or breakout. No one wants that on their special day! 37. Wear a dress shirt when you're getting your hair styled — that way the button down is easy to pull on and off without messing anything up. 38. Splurging on a makeup artist is worth it, especially since there will be tons of photos on your special day. But be sure to settle on a look you love first. 39. It's worth trying multiple different hair and makeup looks until you land on the perfect one. 40. Spray a heavy-duty fixative to protect your makeup, like Ben Nye’s Final Seal, especially if it's an outdoor wedding. 41. It's also handy to buy some wine wipes to prevent the dreaded wine mouth. 42. Keep body/double-sided tape and safety pins on hand. You never know if you might need them. 43. Take time off the week of your wedding — especially if you have friends and family coming into town. You'll want to be spending this amazing occasion with them instead of being stuck at work. 44. Spend the day before doing something you both love and make sure to get a good night's sleep. 45. Pack a wedding bag ahead of time full of things you don't want to forget on your big day. 46. Get good at taking ALL your vitamins before your big day, especially vitamin C, so you lessen your chance of getting sick. 47. You'll be pulled in many different directions and staying busy on your big day, so make sure you take time to eat something substantial before your moment. 48. Eat a breakfast that has lots of high in protein and complex carbs so you can run on good energy throughout the (long) day. 49. Give yourself PLENTY of time to get ready — you don't want to feel rushed! 50. Find someone who will be your "texting person" the day of your wedding so you're not stressed and/or glued to your screen. 51. If your wedding is outdoors during the summer, you can create programs that also double as fans. 52. Or don't spend money on wedding programs at all and use a blackboard to inform your guests of the itinerary. 53. Consider having your ceremony seating in a circle so you can actually be surrounded by the people who love you. 54. Stray away from tradition by giving your groomsmen succulent boutineers. 55. A clever way to provide tissues for your guests is to include them in the program. 56. Put on a small amount of hand lotion before walking down the aisle to ensure the ring will glide right on your finger. 57. Dab your pits before walking down the aisle. 58. If you're taking wedding photos beforehand, make sure you and your photographer really communicate on the type of aesthetic you're going for so everyone ends up happy. 59. Save money by only hiring a photographer for the "big" wedding moments and not throughout the entire evening. 60. On a sunny day, you'll get harsh sunlight at noon — so DON'T schedule photoshoots for that hour. 61. In place of an aisle runner, use rose petals. 62. Tying ribbons to the backs of chairs is a great way to add a little bit of color and fanciness. 63. Use signs (or DIY your own signs) to provide guests with directions instead of hiring help to point people in the right place. Get this cinema light box on Amazon for $19.99. 64. Instead of wedding favors, have your guests bag their own with a candy spread. 65. Or skip wedding favors all together. Your guests won't notice or complain! 66. 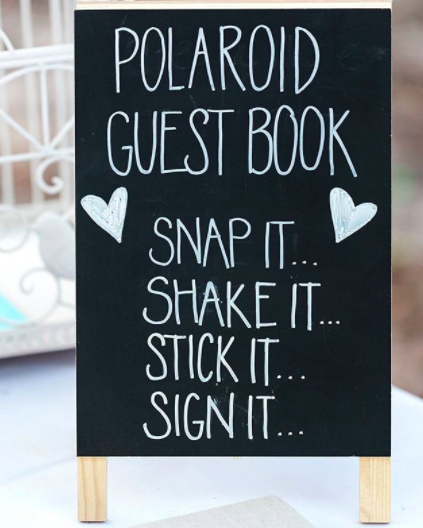 Put a different spin on your guest book — like having people take Polaroids and sign them or have them sign Jenga pieces. 67. 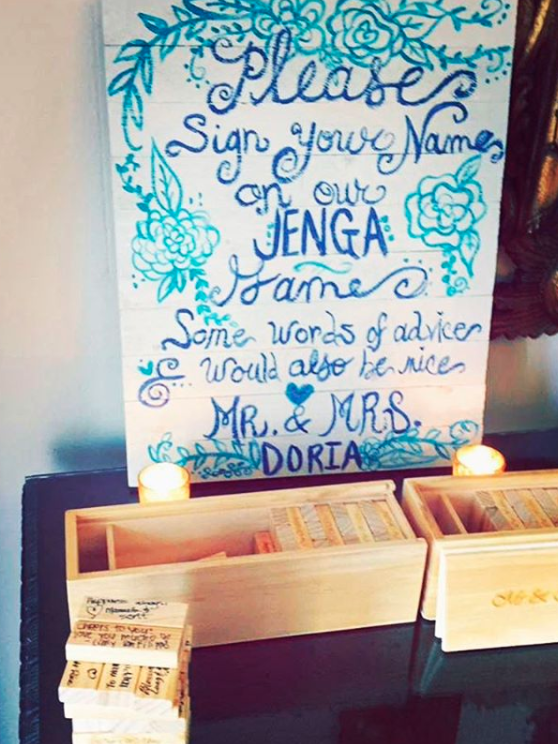 You can also have your guests leave notes for you in a piñata instead of having a guestbook. 68. Have your guests participate in small activities, like writing a "date night idea" on a popsicle stick and putting it in a jar. 69. Or have a "guest box" where people can record messages to you instead! 70. DIY an adorable box for any cash or check gifts. Particularly helpful if you don't want to do a registry! 71. It's a good idea to have guests fill out envelopes with their addresses at the reception. That way, thank you cards are easier to send! 72. Be creative with how you label your table numbers. 73. Use clear decal stickers to make your table numbers (no need to write each one out!). Get a set of 30 decal stickers from CutOutArts on Etsy starting at $4. 74. Create a one-of-a-kind table runner made from family photos. 75. Using classy disposable napkins will keep your tables looking fancy while saving you money. Get these disposable dinner napkins on Amazon for $24.99 (for a box of 50). 76. While you're at it — also use classy disposable plates and cups for dessert! Get this disposable plate set on Amazon for $38.99 (for service for 24 people). 77. Get lavish yet inexpensive table clothes by using sheets from IKEA. 78. Keep your child guests entertained by providing fun coloring books. 79. A cheap, classy, and crafty alternative to candle holders is making your own by DIY-ing them with wine bottles. 80. Add even more class and flare to your balloons by putting tassles on them. 81. Add an extra flare of creativity by crafting your own confetti bar. 82. Heart-shaped sparklers can add an adorable twist on your ceremony exit versus throwing confetti or blowing bubbles. 83. Get crafty by DIY-ing some vibrant paper pom pom vines for decor. 84. Include a perfect place for photos by creating a carnation curtain. 85. Want a photobooth but also want to save money? Invest in a simple Selfie Stick and backdrop. 86. If you have a friend who knows their way around sound, save money by having them be your official DJ. 87. Wedding cakes can be pricey, but don't feel like you NEED one. There are so many fun alternatives! 89. And, although it's not traditional, Polaroid photos are an alternative to a cake topper and add a personal touch. 90. If an open bar is out of your price range, try DIY-ing your own "watercooler bar." 91. Don't split up during your reception to entertain different guests. That way, you share the same memories of the evening together. 92. Try taking “table photos” to say, "hi" to everyone without taking up your whole night. 93. Appoint a specific person to save you from extra chatty guests so your time can be spread amongst everyone. 94. Keep food coming even after the reception — even if it's something as simple as fries. People will get hungry after drinking and dancing, and they'll thank you! 95. Honestly? Eat whatever you want to eat. It doesn't have to be chicken or fish — it can be pizza! It's YOUR wedding. 96. Put money in your pocket by selling items you won't use again (like tablecloths and runners). 97. Have fun adding unique but practical things to your registry. 98. When opening gifts, appoint a person who can apply a name + sticky label to the gift — that way you'll know who it's from when writing thank you notes! 99. Wait a day before you leave on your honeymoon so you can decompress a little before hopping on a flight. 100. Remember that you don't have to say yes to everything. Saying no to things can save you time and stress! 101. Expect things to go wrong, but try not to stress. No wedding is 100% perfect. Enjoy the reason you're there!